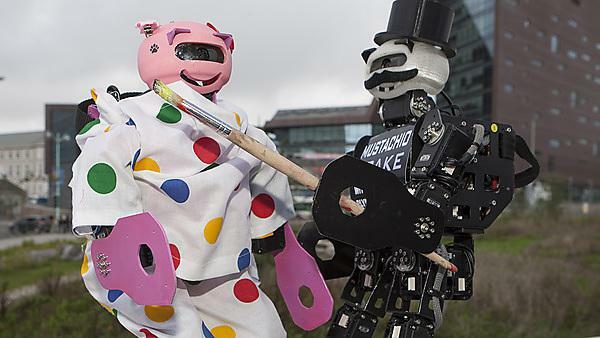 The Centre for Robotics and Neural Systems (CRNS) is the UK’s leading university developing small humanoid robots. Our robots are 40cm tall and use over 20 high-speed digital servo motors for controlling the movement of the head, arms and legs. They use the latest low power multi-processor architecture to process a range of camera and sensor information which is used to control robot balance, motion, navigation and game play strategy. The hardware and software is designed and developed by a team of students and staff from computing, electronics, mechanics and robotics with the aim of winning international robot sport competitions. 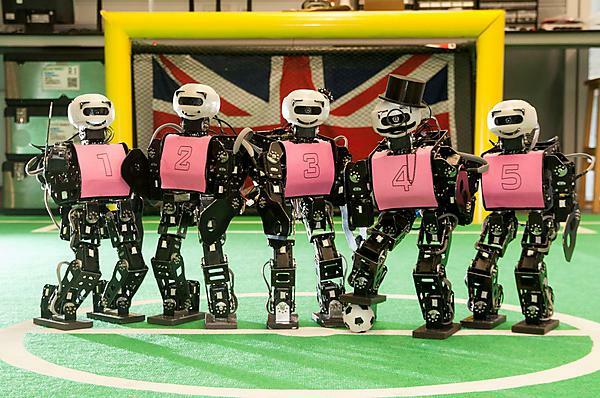 In 2012 the Plymouth Humanoids became the first ever UK team to compete in the RoboCup Humanoid league, which is the robotic equivalent to the football World Cup. 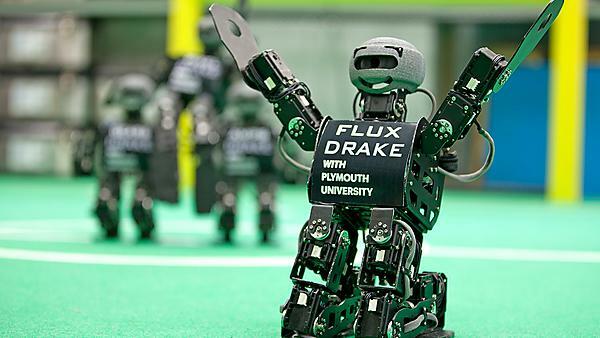 We also won gold in the marathon and silver in the sprint events at the FIRA International RoboWorld Cup athletics competition held in Bristol in August 2012. We ranked 12th in the world in kid-size Robocup 2014 held in Brazil following the world cup. In 2015 we took a year out of competition to engineer a teen/adult sized robot called Scott. See photo of 'Scott' and a smaller kid-size 'Drake' robot. Robotics students - get involved! Our robotics students are actively involved in the robot football project. The robots are designed and built by students and staff here, so as a student, you have the opportunity to get involved in a project to extend the features of the robots, their electronics, mechanics and software. Potentially, you could be in the engineering team that travels and competes all over the world. The student-led Robotics Society meets weekly. The society is a hands-on group where students build robots, visit robotics companies and participate in student outreach events to schools and the general public. Find out more on our robot specifications.